The southern region of India comprises of four states namely Tamil Nadu, Kerala, Karnataka and Andhra Pradesh and the union territory of Pondicherry. The weather in these regions is mainly hot and pleasant during winters. The coastal areas are pleasant throughout the year with heavy rainfall during the monsoons. South India follows the Dravidian tradition and has different ways to celebrate their own festivals. Karnataka celebrates all the national festivals and other religious festivals. But the most famous of them all is its special Dushera, popularly known as the Mysore Dushera. The Kannadigas celebrate this festival with pomp and glamour and dedicate the festival to Goddess Chamundeshwari. It is a 10-day long festival which falls in the month of October. On the last day of Vijaya Dashami, a colourful procession of caparisoned elephants carrying the idol of goddess Chamundi is taken through the gaily-decorated streets of the city. The festival was started by the Maharaja of Mysore and is being continued till date. The palace is illuminated every night and on the last day the former Maharaja leads one of India's most colorful processions. People from all around the world gather to watch the pomp and show exhibited in Mysore. The festival is celebrated in a grand style with scores of cultural performances in the great Durbar Hall of the Maharaja's Palace. Indeed a unique celebration of the common festival of Dushera. Another unique festival of Karnataka is the Karaga which is celebrated in Bangalore in the honour of the queen of Pandavas, Draupadi. Karaga is celebrated on the full moon day of April, the first month of the Kannada calendar. Yugadi is the New Year celebration in Karnataka. This falls on the day after the new moon day in April, the month of Chaitra. The formation of the Karnataka State is celebrated on the 1st of November and is a state festival. The state of Andhra Pradesh lies on the south eastern side of India. The Telgus, as the people of Andhra are called, are religious and celebrate the festivals with great enthusiasm. Hyderabad being the capital of this state, which was ruled by the Nizam, has seen the state celebrating the Id festivals with great fervour. Biryani and Haleem preparations are the specialty of Telgu Muslims during Ramzan. The festival of Makar Sankranti holds special place in Andhra community. This harvest festival is celebrated for 3 days in Mid January. The first day is Bhogi that is spent with gaiety. The second day is Sakranti. Many families arrange a doll show and invite their friends and give alms to the poor. The third day is Kanuma when they acknowledge their gratitude to the part taking of the animals. They decorate and worship their cattle. The New Year falling in the month of April is called the Ugadi and celebrated with new clothes and sweets. The birthday of Lord Ganesh, Vinayak Chaturthi, falling in September is celebrated with great enthusiasm. Huge idols are installed and worshipped and on the last day they are immersed in the water. Kerala, famous as God’s own country, is famous for its back waters and boat races. This small state has nearly equal population of Hindus, Muslims and Christians staying and celebrating their festivals in harmony. Vishu is the New Year of the Malayali people, which falls every year on 14th of April. The Keralites believe that they should see the best things when they wake up in the morning. Huge flower decorations and other goodies are kept in front of the deities and worshipped. Sweet meats are prepared out of jaggery, rice and coconut. Another important festival is the Onam. Onam falls in August – September. This day is celebrated in the honour of the King Mahabali who once ruled Kerala. His period is believed a have been the golden age in the history of Kerala. He was a threat to the Gods and so they got him killed. But since he had proved to be a good king he was allowed to return to his country once a year. Onam is that day of the year and the people of Kerala rejoice the homecoming of their King. Elaborate flower motifs are made in front of their houses to welcome him and a fully vegetarian feast is cooked to satisfy the Kings palate. 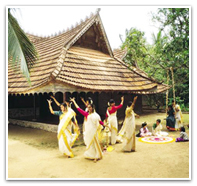 The Malayalis wear their traditional dresses, laden with gold ornaments and exchange gifts. Trichur Pooram is celebrated in the sweltering heat of the summer season at the Vadakkunathan Temple in Trichur. It is believed that on this day the respective deities of other temples visit Vadakkunathan temple. Nine Deities from the neighbouring temples pay homage to Lord Shiva at the Temple. Processions of beautifully caparisoned elephants provide a magnificent spectacle. The festival is rounded off at night by dazzling firework displays. It is only on the day of Trichur Pooram that the non-Hindus are allowed to enter the ancient temple of Vadakkunathan. The southern most state on the eastern coast of India is Tamil Nadu. This southern state is popularly known as the temple state of India. The main local festival celebrated here is the Pongal. Pongal is the harvest festival celebrated for three days in Tamil Nadu. Bhogi is celebrated on January 13, Pongal on January 14 and Mattu Pongal on January 15 every year. During this time people wear new clothes and draw beautiful motifs in front of their houses with rice flour. The cattle too is decorated and rested during this time. Sweet made of the first rice is cooked, which is known as the Pongal. Commonly known as the Float Festival, this magnificent festival is celebrated in Madurai. On the night of the full moon in January, ornamented icons of goddess Meenakshi and her consort are taken out in a colourful procession to the huge Mariamman Teppakulam. The icons are floated in the tank on a raft decked with flowers and flickering lamps. The Meenakshi Kalyanam is a ten day festival, which takes place in April – May at Madurai. On this day the Goddess Meenakshi is wedded to Lord Shiva. The deities are taken out in the decorated chariots and the festival is celebrated with lot of pomp and show. The Karthigai Deepam festival can be termed as an extension of Diwali in Tamil Nadu as it falls just after the main festival of Diwali. It is the festival dedicated to the immortal light created by lord Shiva. Many houses add one lamp for the day from Diwali and by this day the houses are full of Lamps. The lamps are worshipped and they burn day and night also on the streets. Situated on the Coromandel Coast, about 160 km south of Chennai, lies the Union Territory of Pondicherry. The French ruled this territory for 300 years, and today, it stands as a living monument of the French culture in India. Festivals are organized nearly every month in Pondicherry. With the still persistent French influence, the festivals although similar, have a slight difference from the rest of India. Pongal of Tamil Nadu is celebrated with equal fervour in Pondicherry. The Masimagam festival in mid March is a huge celebration when deities of around 50 odd temples from nearby reach Pondicherry. A sanctimonious sea bath is then held on the beach. Thousands come to witness and participate in this festival. The Veerampattinam and the Villianur Car Festival are held in July and May respectively. The deities of these temples are taken out on carriages, which are drawn by devotees. Masquerade, held in March - April, is a popular mask festival, during which brilliantly costumed and masked people of Pondicherry, dance down the streets to the music of trumpets and accordions. During the Eve of the Bastille Day in July, retired soldiers parade the streets in war finery, singing the French and Indian National Anthem.